A few months ago I was listening to National Public Radio and heard a story that mentioned George Mason’s Center for the Advancement of Well-being. It caught my attention – wait, something like this exists? Several months later, I reached out to the center’s Executive Director, Nance Lucas, to find out more. She discusses the center, the stresses of being a college student today, and where individuals and companies can go to learn more about mindfulness, well-being and the latest research. LS: Tell me about the Center for the Advancement of Well-being. What prompted the creation of it at George Mason? NL: Before it was named the Center for the Advancement of Well-being, it was called the Center for Consciousness and Transformation. In 2008, individuals who had a relationship with George Mason University, Don and Nancy de Laski, both patrons of the arts, were at a place in their lives where they wanted to significantly contribute to students finding greater meaning and purpose in their lives. To make a long story short, they focused their contributions on Mason because of the university’s ability to be nimble and innovative in thinking, and to break through interdisciplinary boundaries. We had some existing course work that they thought would provide a good foundation for the start of this new center as well. In 2013, we formally changed our name to the Center for the Advancement of Well-being to more fully align with our focus, our vision and the expertise at the center. LS: What were some of those “foundational” courses? NL: These were courses that were taught across the university on spirituality, meaning and life and purpose, psychology, religious studies, philosophy, conflict resolution, consciousness and meaning-making in the arts, etc. There was interest from a wide range of faculty and staff from different programs around consciousness and transformation that morphed into a coherent agenda around well-being. LS: In my firm’s higher education design work, we have seen well-being emerge as an important factor for students. We’ve heard there is increased stress, increased suicide rates, and other indicators that show students are suffering from a variety of mental health issues. Are you all seeing any particular issues emerging at GMU or were there other drivers? NL: What we are noticing as an institution – and this is a higher education trend – is that there is a significant increase of students today who have mental health challenges, and the number is the highest it has ever been historically. This has resulted in a need for a more systemic approach to well-being as an institution, and every university and college is facing that same phenomenon around student mental health. The traditional model is to increase the number of counselors and psychologists to meet the demand of counseling services. 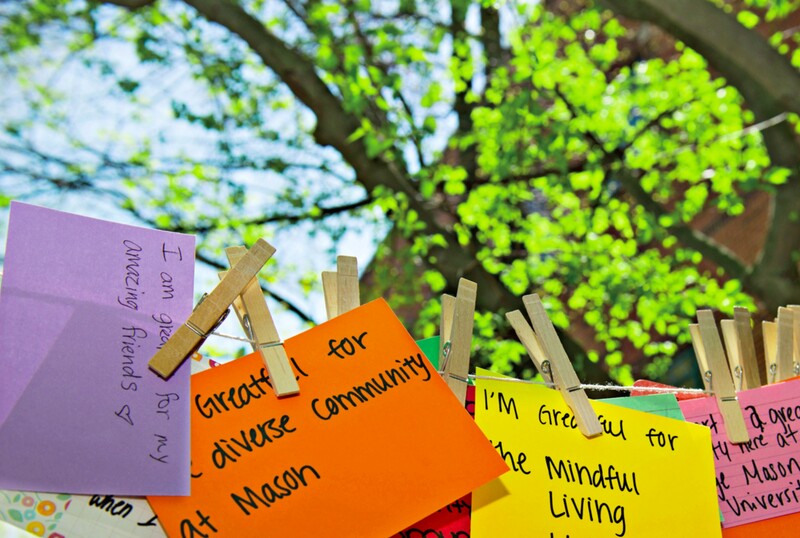 We’re aware of this at Mason, but we also believe there is a need for the entire institution to create pathways for students so that they have tools to respond in more resilient ways to life’s challenges, to understand and explore what it means to have a life well lived and to have greater meaning and purpose in their lives and their academic and career paths. LS: Why is stress so high for students today? Firstly, the pressure we put on young people today is phenomenal. We put pressure on students to meet certain academic high bars, to get into the best schools, and to have a number of AP credits completed before they go on to college. We used to see students who might have 1 AP course. Now, some students are cutting off an entire year of college before they come here with AP credits. That is a lot of pressure to perform! It’s just the nature of how secondary education has changed dramatically in our country. Students today are under such extreme pressure and they’re coming to our institutions already showing stress, anxiety, and the inability to cope with multiple demands. Secondly, students today have as sort of Teflon protection that surrounds them. The whole time they are in high school and even prior to high school, their parents or family members keep them in a bubble, which protects them from experiencing failure and responding to challenges (i.e. everyone gets a trophy even if the team loses massively throughout the season). When they come to a university, they are expected to be more independent, yet they lack the skills and resources to do so. We have parents who call us and ask professors to change their son or daughter’s grades. Why? Perhaps it’s because our society puts so much pressure on young people to get into the best school or to excel in everything they’re involved in. Somehow we have lost our way with what it means to raise children to be more interdependent and to pursue their own passions and interests. Thirdly, there has been a change in the sheer amount of time students devote devices such as iPads, iPhones, and all of the social media where they’re constantly plugged into something. You want to say to students, “Stop Googling and start talking to people!” That is another aspect of our society that did not exist 10-15 years ago. It robs young people of the ability to develop high quality relationships with their peers, their teachers, and with adults because they spent a large majority of their time on these devices and less time on inter-personal connections and cultivating quality social support mechanisms. LS: I have two small girls and way too many devices in our house! You are really making me think hard about what that means to their future. NL: Just walk into a restaurant and look around. You might see a family sitting at a table and typically one of the parental units is on a device, and so are the kids. If the parents can’t model what it means to have a conversation and take a break from emails, Facebook or social media, why should their children change their behavior? LS: How does the center support faculty and staff vs. supporting students? NL: We are exposing faculty and staff to the emerging science around well-being, the evidence-based practices that are emerging from the science, and how this whole body of scholarship is centered around more optimal human functioning. We have created faculty learning communities which look at how we might redesign existing courses to create modules around well-being. We have come to understand that just about every single field or discipline has something to contribute to the science and application of well-being. 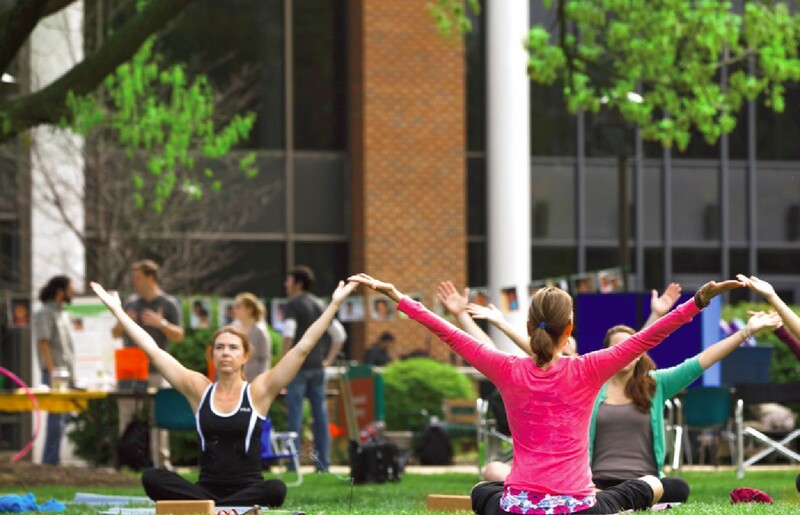 Well-being is becoming a unifying connector across the university. We’ve used it as a tool to revitalize the curriculum in many ways. We’re making the tent as large as possible so that everyone can shape and advance our agenda around well-being. This is important for long term sustainability. LS: It sounds like you are really changing the culture at George Mason. NL: It’s like running a social movement. We are fortunate at Mason that this movement started at the grassroots level, and now it also has top down support. LS: Are there examples of how faculty incorporated concepts of well-being into their courses or research? NL: Yes. For example, one of my colleagues at the center is working with our provost’s office to create a well-being pathway in our general education program (where students have to complete 18-24 credits in areas such as Western Civilization and Social Behavioral Sciences. My colleague met with general education instructors and he asked if they could integrate well-being into their existing courses. He received enthusiastic responses from every faculty member he met with. For example, one history professor selected well-being related readings for his course. Other global education faculty member is planning to show students how well-being is measured in different countries and how those countries compare with one another. For example, typically the Scandinavian countries score higher on well-being in these global indexes because of higher income levels per capita GDP, better national policies related to health care and unemployment, and greater civil liberties. In student affairs, the Office of Student Involvement created a new initiative that provides training for students to become well-being peer educators. A group of 8 students is going through training now and will eventually facilitate peer-to-peer education with students around mindfulness practices, how to create and sustain positive relationships, and how to become more resilient. Peer influence is so strong with students, which is why this new initiative is so important. LS: Talk about the mindful living residential community at George Mason. My firm has been researching and designing live-learn communities for a while, and have seen incredibly positive results from this model with the combination of living and academic space in one. How does the mindful living community work? NL: This is a place where students can engage in common learning and feel safe in doing so with their peers. They are with a group of like-minded students who are interested in and passionate about exploring deeper meaning and purpose in life, exploring what it means to be flexible, nimble, and vulnerable while being supported in their learning journey by faculty and their peers. Students start in the mindful living community their freshman year and can continue through their sophomore or junior year. Students form support systems with each other and the faculty, while being exposed to knowledge that we didn’t have 15 years ago. LS: Is there a perfect size for a residential community like this? NL: We cap our enrollment at 48, which is about as large as we want it to go. That includes some upper class students in there who are in it for the second or third year, but the majority are freshmen. If it gets too big, it is difficult to develop community where meaningful relationships can develop. LS: What is the “Leading to Well-being” conference? NL: The conference was co-created by MasonLeads (a university-wide leadership collaborative) and the Center for the Advancement of Well-Being. We thought it was important to intentionally make the connections between leadership and well-being. Nothing existed like this we when sponsored the first conference in 2010. We used a combination of internal expertise at Mason and external scholars and practitioner’s from around the world to help shape this program over time. We have experts in positive psychology and leadership studies, practitioners who are “good consumers” of the scholarly work and successful in applying these concepts in organizational settings. The idea was to share our knowledge and ground breaking interventions to help organizations transform their organizations as we were doing this at Mason. Every year, we bring in experts in leadership and well-being as well as participants who want to explore what this looks like on the ground. LS: Are you starting to see your students taking new career paths because this program is in place? NL: Yes and I believe our students in general want to apply what they are learning about well-being in their jobs so that they can be the ripple effect of facilitating others’ well-being. I also just had a conversation with a student today who is pursuing a master’s degree with a concentration in well-being and leadership. His career goal is to work in an HR firm or be the HR person in an organization focusing on employee well-being. Students who are graduating who have taken our courses around mindfulness and well-being are committed to integrating what they have learned into their jobs. For example, one of our graduates who is a physical trainer has taken what he learned around mindfulness and applied it to his work as a trainer. He claims that the people he works with do better because he has combined what they are doing with their physical regimen, while exposing them to concepts of how their body is connected to their mind. Another one of our graduates got a job at an architectural firm and was asked to create a company mindfulness program for their employees based on the coursework she completed through our center. LS: For people like me who are interested in getting involved with your program from industry, how can they do that? NL: We do offer courses, certificate programs as well as executive education programs that we can also customize for whole organizations. The Leading to Well-being: Cultivating Resilience Conference is also a great place where people can participate. Our website is a great resource and we also have a Facebook page that provides resources and a network of like-minded people committed to advancing well-being. Nice, Leigh! Thank you for sharing.